Im currently away on holiday in Spain, right near Barcelona! Although I don't have internet access a lot of the time I just wanted to post a quick OOTD. We went out for dinner last night in the local town (more to come on all that once i'm back in the UK) and decided to wear one of my new outfits. V neck cami from River island £16- I really like this cami as its double layered at the front. I tend to avoid white and light coloured tops usually as I hate it when you can see your bra though it but the double layering on this one covers it up completely! 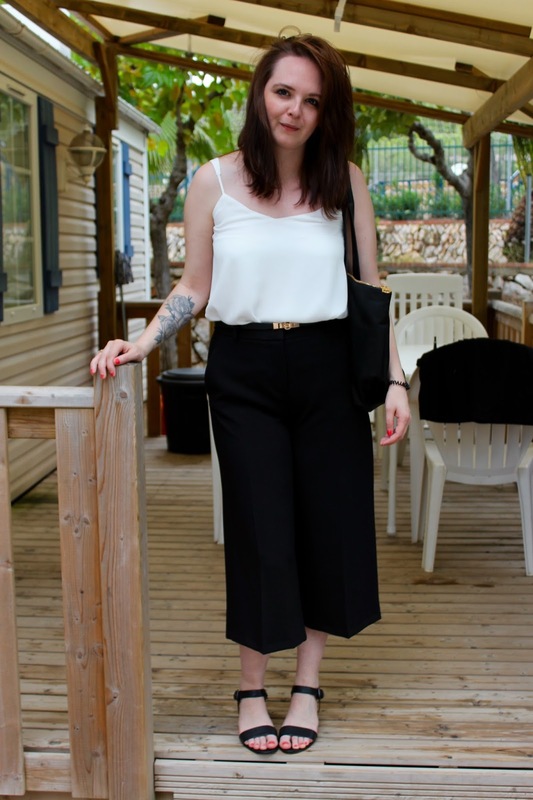 Black Belted culottes from River Island £35- totally in love with these culottes! They fit so well and I'm loving that they are slightly high waisted as it makes them feel a lot more flattering. They also come with a little gold detailing belt. Miss KG 2 part heels approx £25- I haven't been able to find these exact ones- they were such a bargain I think they may have sold out but here are some similar ones by Miss KG. H&M shopper bag £19.99- okay you can't see it too much in this picture but its the ideal bag for holiday! Going to Barcelona I was worried about using a backpack to keep my money,camera and everything else in so wanted a zip up shopper to keep everything safe. I also used it for my carry on bag for the flight and it comfortably fit my Macbook,camera and a massive Elle magazine in! As you can see from the photo I haven't massively caught the sun whilst here yet.. but I do keep thinking pale skin equals no sun damage or peeling in a few weeks! Anyho.. best get back to relaxing and enjoying our last weekend away. Tomorrow we are going back to Barcelona again and doing the proper touristy sightseeing bus. It costs 27 Euros for the whole day and it means we get to see all the amazing sights around the beautiful city!